DVS shoes together with five respected skateboard photographers have a new line of shoes called “The photographer series”. Each of the photographers picked a DVS style and customized it with the materials, colors and graphics that reflects them. Inside the shoeboxes you’ll find five collector’s postcards. It looks like all of them, except Giovanni Reda’s, have one or several photos printed in or on them. They look pretty nice if you ask me. 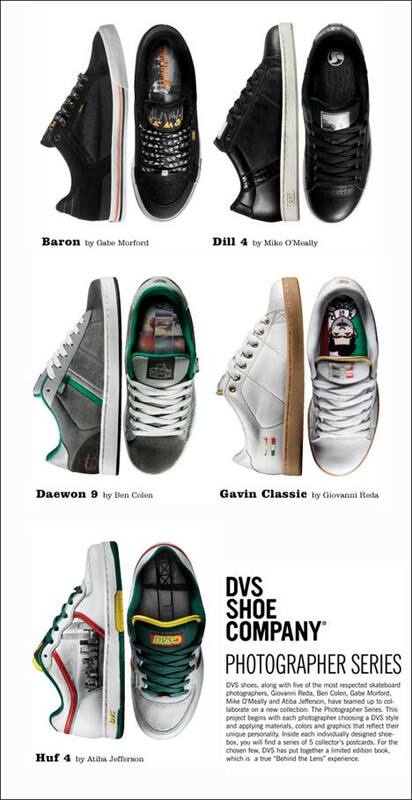 I haven’t had any experience with DVS shoes though.